NICE Systems (NASDAQ: NICE) is the leading provider of Insight from InteractionsTM, offering comprehensive performance management and interaction analytics solutions for the enterprise and public safety and security markets. Advanced interaction analytics are performed on unstructured multimedia content - from telephony, web, radio and video communications. 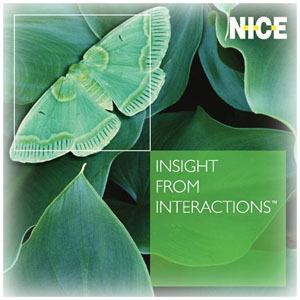 NICE brings the power of Insight from Interactions to IP contact centers, branches, and command and control centers. NICE's solutions are changing the way organizations make decisions, enabling them to proactively improve business and operational performance and address security threats. NICE has over 24,000 customers in 100 countries, including over 85 of the Fortune 100 companies. NICE Insight from Interactions solutions are used throughout the enterprise market, and across the whole range of security market organizations. NICE’s next generation security solutions empower security personnel to detect, prevent and respond to threats in real-time, and to investigate and reconstruct criminal and security cases using video surveillance and control services, incident monitoring, and reconstruction solutions. NICE solutions provide a complete, unified, chronological, multimedia history of incidents implementing real-time video analytics, IP networking, recording and management for automatic threat detection, instant verification, event resolution and effective investigation. NICE provides advanced solutions for all four security market segments �C homeland security and first responders, transportation, government and the private sector. With more than 600 support professionals and 140 service partners around the world, NICE provides the highest quality of service to all customers, with complete life-cycle support �C from discovery and requirements definition through success evaluation. NICE offers a wide range of global customer training and certification programs, designed to help customers get the very best out of their NICE solutions. NICE's solutions serve over 24,000 customers worldwide, including over 85 of the Fortune 100 companies.